Call for pricing as all listed links are list price only! Saginaw Control & Engineering’s Type 12 Pushbutton Enclosures are designed to house oil-tight push buttons, switches, and pilot lights. Saginaw Pushbutton Enclosures are primarily used in an indoor environment to protect against dust, falling dirt, dropping of non-corrosive liquid, and light splashing of water. Can be custom ordered in Type 304 or 316 stainless steel. If you are looking for Saginaw Enclosures, please call us at (800) 699-0290 or email us and we will do our best to help you find the Type 3R Saginaw Enclosure that you are looking for at the most competitive prices possible. If you are searching for NEMA 4X Saginaw Enclosures technical information (data-sheets) please use the datasheets or product selection guide page links. Saginaw Control & Engineering’s Type 12 Operator Systems are designed to house a wide variety of equipment; panel mount, rack mount, desktop PC’s, industrial monitors, keyboards and panel views. These enclosures are primarily used in an indoor environment to protect against dust, falling dirt, dropping of non-corrosive liquid, and light splashing of water. One-piece construction allows flexibility and maximizes the usable interior space. Memory retaining oil resistant urethane gasket. Exclusive SCE concealed hinges on work station enclosures. Work Stations are available in textured beige or 304 stainless steel. Slope Top Workstations have 20 degree sloped top and 12.5 degree sloped keyboard desk. 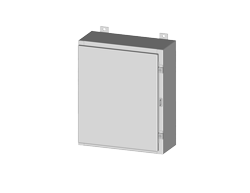 Operator system enclosures can be custom ordered in type 304 or 316 stainless steel. Saginaw Control & Engineering’s Type 1 Enclosures are designed for control and instrumentation applications. They are a general-purpose enclosure intended for indoor use or locations where unusual service conditions do not exist. Type 1 Enclosures primarily provide protection against accidental contact with live parts and against a limited amount of falling dirt. The SCE design incorporates an exclusive sub-panel design, which maximizes available space for all size enclosures. Any of the standard SCE quarter turn replacement latches and handles can be used in the Type 1 products. Type 1 Enclosures with knockouts have keylocking latches. 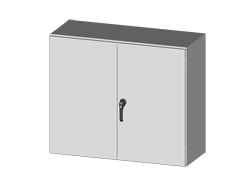 Continuously hinged doors are easily removed from enclosure body. Type 1 Enclosures have ANSI-61 gray powder coat finish. Type 1 Enclosures with knockouts are available in precaution blue, safety orange or taupe tan textured powder coat finish. Saginaw Control & Engineering’s Type 3R Enclosures (NEMA 3R) are designed to house electrical controls, instruments and components. These enclosures are primarily used in an outdoor environment to protect against rain, sleet and snow, and indoors against dropping water. Saginaw Control & Engineering’s Type 4 Enclosures are designed to work in a wide range of environments indoors or outdoors, and house electronic controls, instruments, and components. These enclosures provide protection from wind blown dust, rain, splashing water, hose directed water and ice formation on the enclosure. ANSI-61 gray powder coated finish. Exclusive SCE concealed hinges on Enviroline Series Enclosures. Many of the standard SCE quarter turn replacement latches and handles can be used on Enviroline Series Enclosures. Saginaw Control & Engineering’s Type 4X Stainless Steel Enclosures are designed to work in a wide range of environments indoors or outdoors, and house electronic controls, instruments, and components. Saginaw NEMA 4X stainless steel enclosures provide protection from corrosion, wind blown dust, rain, spraying water, hose directed water and ice formation on the enclosure. Saginaw Control & Engineering’s Type 4X S.S.Disconnect Enclosures are designed to work in a wide range of environments indoors or outdoors, and house most standard types of disconnects and circuit breakers as well as house electronic controls, instruments and components. These enclosures provide protection from corrosion, wind blown dust, rain, spraying water, hose directed water and ice formation on the enclosure. 304 & 316 stainless steel with #4 brushed finish. Provides provisions for flange mounted disconnects and circuit breakers. Any of the standard SCE quarter turn replacement latches and handles can be used on Enviroline Series Enclosures. Saginaw Control & Engineering’s Type 4X fiberglass enclosures are designed for indoor or outdoor use to house electronic controls, instruments and components in areas that may be regularly hosed down, in very wet conditions, or are exposed to corrosive agents. These enclosures provide protection from corrosion, wind blown dust, rain, spraying water, hose directed water and ice formation on the enclosure. Polyester fiberglass sheets are reinforced with short strands of fiberglass in random order in the polyester resin. Quick release padlock latches made of stainless steel. Custom and stock sizes available on request. Saginaw Control & Engineering’s Type 4 Disconnect Enclosures are designed to work in a wide range of environments indoors or outdoors, and will house most standard types of disconnects and circuit breakers as well as electronic controls, instruments, and components. These enclosures provide protection from wind blown dust, rain, splashing water, hose directed water and ice formation on the enclosure. Provides provisions for flange-mounted disconnects and circuit breakers. Saginaw Control and Engineering’s Industrial Modular System Enclosures (IMS) are designed to house electrical and electronic controls, instruments and components, with integrated mounting channels in the top and bottom of the enclosure and grid mounting options making this product more flexible and easier to work with. These enclosures are primarily for use in an indoor environment to protect against dust, dropping of non-corrosive liquids and light splashing of water. White powder coat finish inside and out. Easy to install mounting panels with increased available space. 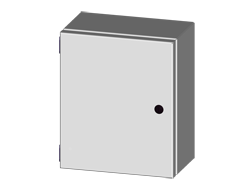 Subpanels can be installed at any depth of the enclosure. SCE exclusive concealed hinges, making doors easy to remove and interchange. SCE heavy duty three point padlocking handles. Flange trough collar around all door openings. A hinged slave door is provided on disconnect enclosures for unobstructed access to the insde of the enclosure. Grid mounting available to take full advantage of internal space. Saginaw Control & Engineering’s Type 12 Enclosures are designed to house electrical and electronic controls, instruments and components. These enclosures are primarily for use in an indoor environment to protect against dust, falling dirt, dropping of non-corrosive liquid, and light splashing of water. ANSI-61 gray exterior with white powder coated interior. Many parts are available in 304 stainless steel for corrosive protection. Exclusive SCE concealed hinges on Free Standing and Wall Mount Overlapping Door Enclosures. Saginaw Control & Engineering’s Type 12 Disconnect Enclosures are designed to house most standard types of disconnects and circuit breakers as well as electrical and electronic controls, instruments and components. Primarily for use in an indoor enviroment to protect against dust, falling dirt, dropping of non-corrosive liquid, and light splashing of water. Provides provisions for flange mounted disconnect and circuit breakers. Many parts are available in 304 stainless steel for non-corrosive protection. Exclusive SCE concealed hinges on Modular Enclosures. 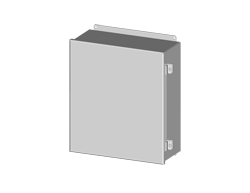 Enviroline Series Trough Enclosures are designed to house electrical controls, instruments and components used in an indoor or outdoor environment. 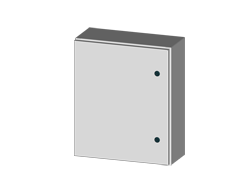 Trough enclosures are available Stainless Steel with #4 brushed finish or Steel powder coated ANSI 61 gray, with or without viewing window. Trough enclosures with window have large viewing area for easy visibility of digital or analog components inside. Designed to house electrical controls, instruments and components used in an indoor or outdoor environment to provide a degree of protection for the equipment inside the enclosure against ingress of solid foreign objects (falling dirt); and provide a degree of protection with respect to the harmful effects on the equipment due to the ingress of water (rain, sleet, snow). Saginaw Control & Engineering offers hundreds of accessories that complement our enclosure product line, making it easy to modify or add special features to standard products.